Confession time: I have never read Garth Nix (even though I have always wanted to, and several of his more popular books are on my TBR). I suppose that makes his upcoming young adult fantasy novel set in a brand new world even more appealing to me, not to mention I find the idea of an immortal woman with terrifying angelic powers absolutely intriguing. “More than a century has passed since Liliath crept into the empty sarcophagus of Saint Marguerite, fleeing the Fall of Ystara. But she emerges from her magical sleep still beautiful, looking no more than nineteen, and once again renews her single-minded quest to be united with her lover, Palleniel, the archangel of Ystara. Liliath knew that most of the inhabitants of Ystara died from the Ash Blood plague or were transformed into beastlings, and she herself led the survivors who fled into neighboring Sarance. Now she learns that angels shun the Ystaran’s descendants. If they are touched by angelic magic, their blood will turn to ash. They are known as Refusers, and can only live the most lowly lives. It does seem a bit more edgy and mature than what I’ve heard about most of his other books! Nice pick! That’s a new to me one! Hope you enjoy it once you get to read it! 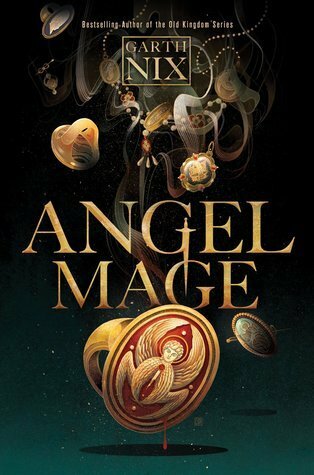 Angel Mage does sound like a good one. Hope you enjoy it when you get to read it! I’ve never read Garth Nix either, I think because his books all seem too young for me. This sounds really good! Yeah, I know he’s written for children and for YA, but I think Sabriel is the one I’ve heard of most and I think that one is aimed towards preteens? So in my mind, his stuff also skews younger. Yay, looks like I’m far from alone with regards to never having read Garth Nix! I’ve not seen this one before and I’ve not read anything by him either although I own a bind-up of one of his more popular series. Thanks for sharing this one. I’m intrigued. I’m guessing it’s his Abhorsen series because that’s the one I have on my to-read list too! Mogsy you have the knack to come with such stunning covers! I do love the cover to this one! I don’t think I’ve read this author before but this does sound quite intriguing – that being said I’m not reading as much YA these days. Hope you enjoy. Yeah, reading YA is risky these days, since there’s so much and you just know they can’t all be winners! I’ve never read Garth Nix either, and like Gaiman I’ve always been curious but just never seem to get around to his books! This definitely sounds intriguing though, I like the angelic angle a lot. Yeah, I have a whole bunch of authors like that on my list – ones I’ve always wanted to read, but just never seem to get around to it! I must be living under a rock because this is my first time hearing about this book?? I love Nix’s approach to magic systems and female characters, so I’m excited for this one! YES!!! Just saw the cover revealed for this the other day I think and a bunch of my friends and I were all squeeing over it. Can’t wait for this one myself!